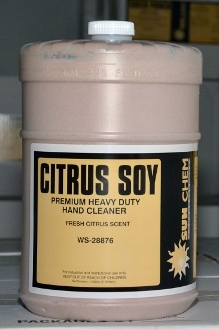 Sun Chem Citrus Soy Hand Cleaner is number one heavy duty industrial hand cleaner that utilizes the natural cleaning power of soy/citrus solvents and abrasive walnut shells to clean the toughest grime and grease. It is enriched with skin softening ingredients to keep the hands from drying, and will leave hands soft. Citrus Soy is an environmentally-conscious choice which uses the renewable resources of soy-based solvents and walnut shells. All industrial settings, such as: manufacturing plants, automotive facilities, print shops, warehouses or wherever hands get dirty. Removes all types of stubborn industrial soils: inks adhesives, grease, tar, carbon and asphalt. .Recommended one gallon flat top dispenser Ws-61128.